A Cameroonian is among this year's Top 10 CNN Heroes. There're lots of phenomenal people on the list working selflessly to change the world, but the story of a doctor offering free health care in a country where health care isn't free and many people can't afford even the most basic care hits home. Every year, CNN honors ordinary people doing extraordinary things around the world. CNN Heroes - everyday people who dedicate their lives to serving others - are nominated by third parties inspired by their cause. After nominations, CNN selects 10 heroes and invites members of the public to vote for their favorite -- to be named CNN Hero of the Year. 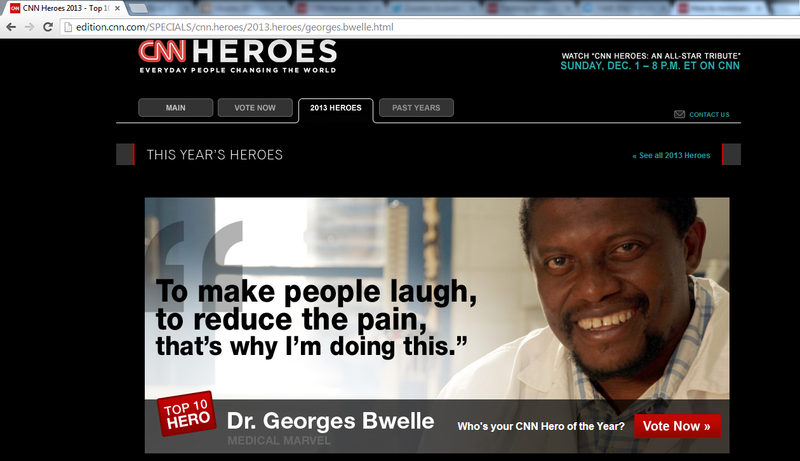 A Cameroonian medical doctor, George Bwelle, is among 2013 Top 10 CNN Heroes. Inspired by difficulties, including lack of neurosurgeons and inadequate equipment faced by his father and many other Cameroonians in receiving medical care, Dr. Georges Bwelle decided to do something about it. He became a medical doctor and started a non-profit organization that travels to rural areas in Cameroon on weekends to provide free medical care. According to CNN, the doctor and his team of volunteers have helped about 32,000 people in Cameroon - a country where there is reportedly only one doctor for every 5,000 people and where many can't afford seeing a doctor -- since two out of five people reportedly live below the poverty line and nearly three-quarters of the country's health care spending is private. I think Dr. Bwelle should be CNN Hero of the Year. Cast your vote. Personally, as a Cameroonian, I can relate to what inspired Dr. Bwelle to take action. Many people in Cameroon face untold difficulties in a bid to receive basic medical care and many end up dying from preventable causes. I lost my father in Cameroon as a result of a private car accident on one of Cameroon's bad roads. Perhaps my father's life could have been saved if we had a working health care system with ambulances and emergency responders. I can therefore relate to Dr. Bwelle whose father was also involved in a car accident that affected him for the rest of his life as a result of limited access to health care. To say the least - there is a desperate need for adequate, available and affordable health care in Cameroon and I appreciate efforts made by Dr. Bwelle and his team to give people access to medical care. 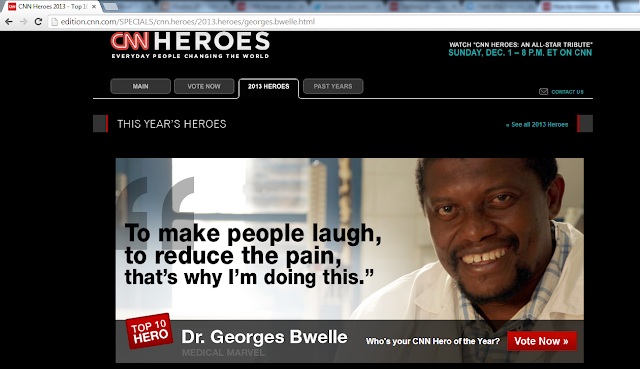 The Top 10 CNN Heroes of 2013 are outstanding men and women, but - without taking away anything from any of them - I decided to vote for Dr. George Bwelle. The good doctor is my favorite. He is doing a phenomenal job in his community, which happens to be in my country. Vote for Dr. Georges Bwelle. It's possible to vote once a day, every day through Sunday, November 17, 2013. The 2013 CNN Hero will be revealed on 1 December 2013. Each of the Top 10 CNN Heroes will receive a sum of $50,000 to support their cause. The CNN Hero of the Year will receive an additional $250,000. Your vote could go a long way to help save lives.